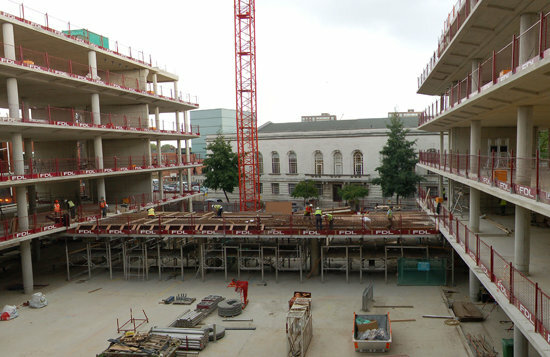 The broad panorama of Hackney's varied skyline was the back-drop to a civic ceremony on 3rd October 2008, to celebrate the Topping Out of the new Customer Service Centre for the London Borough of Hackney. Championed by Mayor Jules Pipe who gave a rousing speech the building will achieve the consolidation of Hackney's local authority properties and staff, into a new "front facing" scheme that will tie a new, more public, building to the existing "ceremonial" Town Hall - and totally change public perceptions of civic involvement. The scheme has innovations in public and administrative efficiency, with new ways of working technologies and systems, the reinvention of administrative processes, and creating a more open and fluid public interface. Hopkins' new building is very open in appearance and, with new public realm, is creating a civic campus and civic focus for Hackney. One of a number of Hopkins Architects environmentally innovative schemes currently being developed, the new Customer Service Centre at Hackney, will achieve BREEAM 'Excellent', the environmental targets of the Mayor's London Plan, and recent upgrades in statutory energy-use legislation. Hopkins' team Ken Hood, project director, Aikari Pang, project architect and director David Selby enjoyed a buffet lunch afterwards with the Mayor and members of the project team. The new building is scheduled to open in early 2010.